These can be combined into a single source supply power to both systems, or separate systems can be used. In terms of engine power, the source should be capable of propelling the (fully loaded) UAV at it’s cruise speed for a specified duration. A general rule of thumb is that in order to maintain cruise speed, the engine should not be operating above 80% power. This leaves an overhead for any maneuvering or overcoming headwinds. Likewise, the avionics power system should be able to comfortably supply power to all subsystems operating at full load simultaneously. It should be able to maintain this for at least 1.5 times the expected flight duration. Generally speaking, there are two major engine types – electrical and internal combustion (IC). 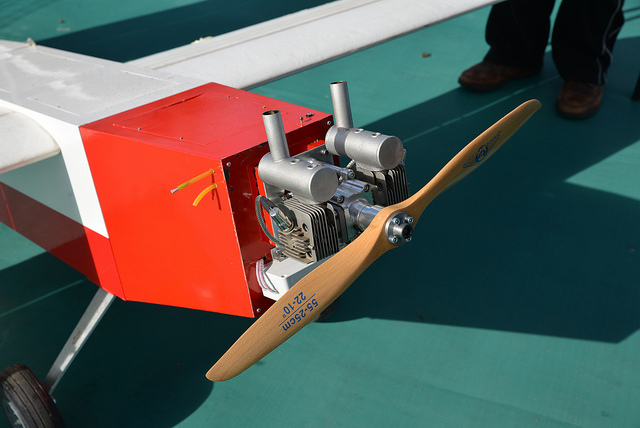 The electrical engines tend to be used on smaller UAVs and IC engines on larger UAVs. Internal Combustion engines are a (very) simplified version of the engine used in a car or lawnmower. A flammable liquid is ignited in a cylinder, the resulting high-pressure gases pushing down a piston. This is repeated many 100’s of times per second to rotate a crankshaft and thus spin a propeller. The ones found operating at the small UAV level will be single cylinder, and very occasionally a twin cylinder. These engines are very simple and do not have any sort of engine management computer of electronics. Just a single control for the throttle. A choke is present for tuning the engine. 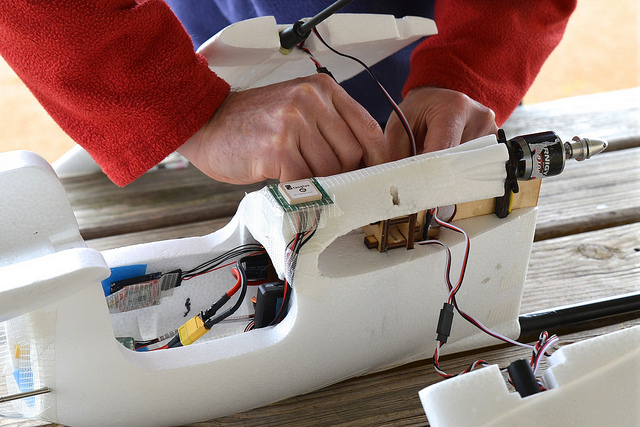 In terms of choosing the correctly-powered engine for a UAV, IC engines have a sizing scheme based on the engine’s capacity in 1/100 cubic inches. So a “60” sized engine has a capacity of 0.6 cubic inches. Generally, this information would be given in the engine’s specifications. Additionally, most RC airframes will specify a “recommended engine size” for good performance. It should be noted that some engines are measure using the metric system (so, cubic centimeters or cc) so a conversion may be necessary. A good guide is that a 35cc engine can power a 7kg UAV quite well, and a 50cc engine can power a 13kg UAV. In terms of choosing the correct propeller, the engine’s specifications will list the range of sized propellers that work. Fuel consumption can vary widely depending on the engine, propeller, wind and mission profile. As a general rule, expect to use 1-2L per hour for a 35-50cc engine. Electric motors tend to be simpler and less “messy” than their IC counterparts. The type of motor used is a 3-phase and can be inrunners (interior copper windings spin) or outrunners (exterior magnetic segments spin). With the increasing power densities of Lithium based batteries, flight times are becoming longer and longer, but less than that of IC engines. Cell rating (ie. 3S, 4S, etc) that indicates the operating voltage in units of Lithium cells – each cell being around 4V. So a motor rated to 3S can take up to 12V. kV speed. This describes the RPM of the motor at full throttle. kV represents RPM per volt of power. So a 900kV motor running at 12V will spin at 10800RPM. Note these values are for an unloaded (no propeller) motor. Associated with this is the maximum operating current of the flight battery and Electronic Speed Controller (ESC) to ensure neither is overloaded. In terms of ESC’s, they will give the maximum operating voltage (as with motors, it’s in units of S) and current (in Amps). Most motors will give a maximum operating current which should be below the ESC’s maximum current. A good tool for calculating electric power systems is ecalc. The avionics power system supplies power to all non-propulsive systems on the UAV. This can include – flight controller, servos, radios, cameras and so on. Due to the sensitive electronics that power is supplied to, the emphasis is on a stable and reliable power supply. This means the voltage regulators must not have any “voltage dip” under large current (such as when a servo is moving), as a big enough dip (ie. from 5V to 4.2V) could be enough to trigger a reboot or crash any sensitive electronics. One way around this (and recommended) is to have separate power circuits for the servos (and any other large-current devices) and another circuit for the electronics. In terms of redundancy, it is useful to have a backup power regulator in parallel. Thus if one regulator fails, the other can continue to supply power. In terms of monitoring, it is very important to monitor the voltage from the power supply and within the power circuit (after the power regulator). By detecting any power system issues early, the UAV can be bought back to base before a complete failure renders the UAV uncontrollable. If the UAV is using a large IC engine for propulsion, it may be possible to fit an alternator to it and obtain a supply of electrical power. The advantage of using this method is that there’s no need to worry about battery capacities or charging. On the disadvantage side, if the engine fails so does the avionics power. The resulting lack of power would prevent the UAV from attempting to glide to landing, or in any case, from any electrically-based failsafe system from activating. Secondly, it is important to check that the power supplied by the alternator is “clean” – that there is no harmonics or interference from the IC engine. A battery (there are many types) simply supplies power to the system during flight. 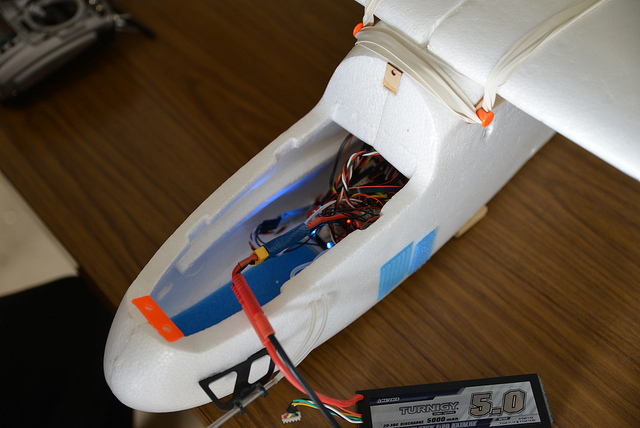 When designing the UAV, it is important to have an accurate measure of the power consumption of the electrical systems to ensure a large enough capacity battery is used on the UAV. From a battery management perspective, batteries should always be checked before flight to ensure they are charged up and any damaged batteries (particularly after a crash) should not be used.